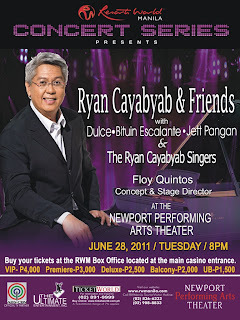 Maestro Ryan Cayabyab and the talented Ryan Cayabyab Singers will treat music lovers and fans with a night of memorable hits and OPM classics, beautifully arranged by the Maestro himself, in Ryan Cayabyab and Friends this June 28, 8 p.m., at the Newport Performing Arts Theater. Floy Quintos directs the show. Aside from being a celebration of beautiful music, the concert also celebrates friendship as some of the country's most gifted singers and Ryan's closest friends will take part in the concert- Dulce, Bituin Escalante, and Jett Pangan. "I'm just so proud of this dream team," Ryan exclaims. "It will be an exciting, memorable night." 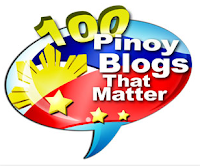 Mr. C noted that director Floy Quintos is equally excited about the show. "He's already thinking of what he's going to put up in that huge LED wall," Mr. C, as he is fondly called, enthuses. "The show will not be only a night of music, it will also be a visual feast." "Ryan Cayabyab and Friends" is the June offering of Resorts World Manila's Concert Series, which previously featured OPM greats such as Lani Misalucha, Christian Bautista, Lea Salonga, Zsa Zsa Padilla, Basil Valdez and Pops Fernandez. Tickets may be purchased at the Resorts World Manila Box Office located at the main casino entrance.